In honor of Black History Month, Carol Hixson, Dean of the University Libraries, and library staff worked together to curate an interactive exhibit that celebrates African Americans yesterday and today. The exhibit, which has a listening station, highlights politicians, artists, authors, and their achievements. On display is a brief description about these icons and features items from our collections. Dean Hixson has worked on the black history month exhibits for the past three years, but this one is extra special because a similar exhibit was launched at our Jupiter location simultaneously. 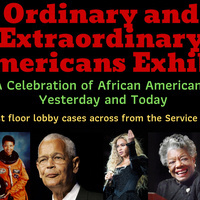 The exhibit is located on the first floor of the Wimberly Library in the lobby. It will be up for the entire month of February and can viewed during library hours.